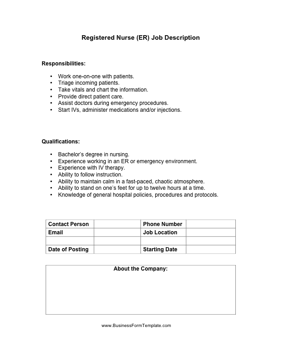 Great for hospitals when hiring new medical staff, this registered nurse ER job describes the necessary responsibilities and demands certain qualifications from applicants. Take vitals and chart the information. Assist doctors during emergency procedures. Start IVs, administer medications and/or injections. Experience working in an ER or emergency environment. Ability to maintain calm in a fast-paced, chaotic atmosphere. Ability to stand on one's feet for up to twelve hours at a time. Knowledge of general hospital policies, procedures and protocols.